Declan and Danielle spent ten years together travelling around Europe and exploring the wine regions which formed the nugget of the dream that was to become McCaffrey’s Estate. Declan’s passion for all things oenological (especially sampling it) and Danielle’s yearning for the country life and a guest house filled with interesting people were to come to fruition on their return to Australia. 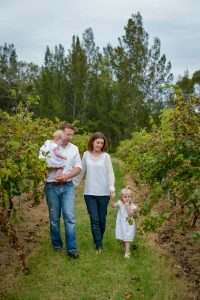 Never ones to shrink from a challenge, Declan and Danielle decided to pack up their life in Sydney, and, along with their one-year-old daughter, establish a home, winery and hospitality hotspot in the Hunter Valley back in 2014. Now, with a second daughter, two dogs, their farmhouse, guest accommodation and 25 acres to manage, they are enjoying the peaceful surroundings of McCaffrey’s Estate, as well as producing quality single vineyard wines and happily entertaining friends old and new. Declan’s boutique winery ambitions are now well under way: The vineyards now comprise 11.2 acres planted in 1990 and currently produce Shiraz, Semillon, Verdelho, Cabernet and Merlot varieties. Plans are in place for a cellar door to open in 2018.